Chester Wright, 77 years of age of Oakwood, VA, passed away Sunday, February 3, 2019 in Bristol Regional Medical Center. Born June 22, 1941 in Wheelwright, KY, he was the son of the late Milton Wright and Anna Mosley Wright. Chester was a retired coal miner and truck driver, an avid cookie jar collector, enjoyed spending time with his family and was of the Christian faith. A loving father, grandfather, great-grandfather and friend. In addition to his parents, he was preceded in death by his wife Lois Ann Matney Wright, son Terry Wright and an infant sister. Survivors include his sons Michael C. Wright and wife Tammy of Shortts Gap, VA, Ricky Chester Wright and wife Beth of Abingdon, VA, Jeffery Wright of Oakwood, VA; grandchildren: Traci Wright Simcox, Garrett Wright, JoBeth Wright, Jessica Wright, Zachary Keen, Ryan Wright and Aaron Wright; great-grandchildren Aden Simcox and Parker Wright. 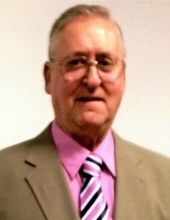 Funeral service for Chester Wright will be held at the Shortridge-Ramey Funeral Home Chapel of Keen Mountain, VA, Thursday, February 7, 2019 at 11:00 a.m. with Pastor Jerry Harman officiating. Burial will follow at the Mountain Valley Memorial Park, Big Rock, VA. The family will receive friends at the Shortridge-Ramey Funeral Home Chapel of Keen Mountain, Wednesday, February 6, 2019 after 6:00 p.m. The family of Chester Wright have entrusted the care of their loved one to Shortridge-Ramey Funeral Home of Keen Mountain, VA.
"Email Address" would like to share the life celebration of Chester Wright. Click on the "link" to go to share a favorite memory or leave a condolence message for the family.